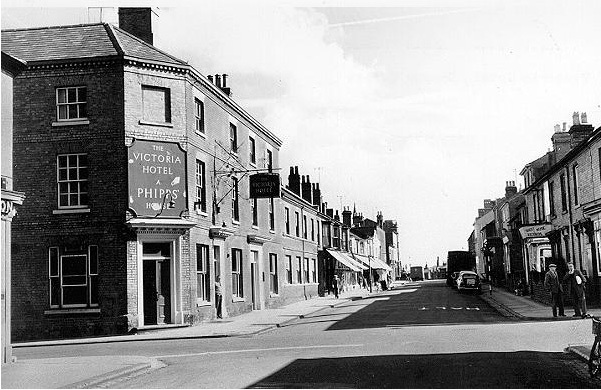 Wolverton was justly famous for its carriage building and you could be sure that once they had come to the end of their useful life as carriages they could be “retired” and put to good use somewhere else. In the 40s and 50s you could discover several of these old carriages around the town. In the photo above you can see a carriage used as a club house for the bowling green at the park. 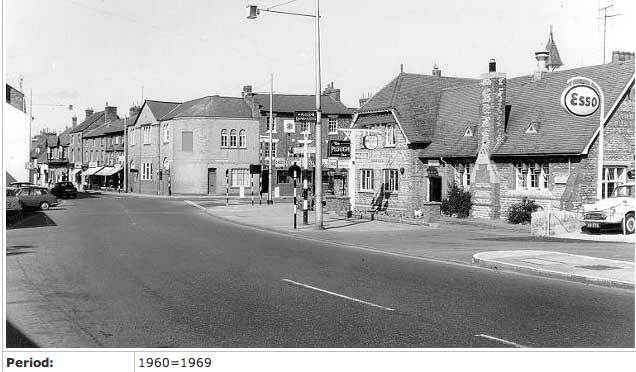 Similarly one was used on Osborne Street as a bar and club house for the cricket and tennis clubs. I also recall one used at the old Youth Club at the back of Anson Road. It was attached to the side of the main building and used in part for the club leader’s office. 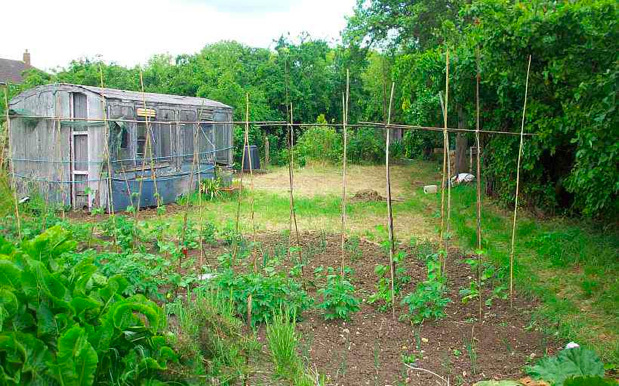 You could also find the odd carriage, or part of one, at various allotments. As I remember them, they all had a nice cosy feeling inside. Here is a really interesting story about the life of one of these old carriages and I am grateful to the telling of it to Kim Pavey. What follows is her narrative, followed by a few additional comments from Jane Bailey. This may be its final resting place after 130 or 140 years, but it has been a great survivor while many brick or concrete built buildings have come and gone during its lifetime. Bill Elliott’s railway carriage on the allotments today. I don’t recall its early history other than that it was built at the Works (in the late 1800’s I believe) but it ended up in Anson Road in the garden of Bill Elliot’s house, where he used it as an office for the Works Union. If anyone has the book “Piano and Herrings” about Bill’s life, it is in there and maybe someone else can fill in that bit. Anyway, there it sat for many years until the mid-80’s when it was slated for removal as the current owner was going to sell the house and the carriage was considered more of an eyesore than an asset. Due to its already fragile condition, that meant it was almost certainly going to be demolished. My step-dad was particularly saddened to hear of its impending fate and made enquiries about acquiring it. The owner had no problem but the difficulty and expense of moving it was a bar. My mother, however, came up with the money from somewhere and we “gave” the carriage to Tony as a Christmas present. We hadn’t actually been able to move it by Christmas morning and as Tony was a big fan of the TV show “Treasure Hunt” we made up a route with clue cards which he had to follow around Wolverton. I had to follow him at a discreet distance to make sure he got all the clues as he would have been completely lost and by about half way round the town I could see he was starting to get very frustrated. However by the time he picked up the last clue taped to the Wyvern railings I think it had dawned on him where he was going lol. Mum had gone on ahead and actually wrapped the carriage in a giant Christmas bow with all the streamers and trimmings, I think it cost almost as much to “wrap” the carriage as it did to move it. We hired a flatbed crane to get the carriage out of the garden and over to our house in Church Street but the narrow alley proved to be so much of a challenge for the truck that all the driver had managed to do by nightfall was get the carriage out to Aylesbury Street, where it sat for a week until we could get another crane to take it to Church Street. We had to keep in constant contact with the police because it was on double yellow lines and since it was technically a vehicle it was parked illegally. Plus it took up half the damn road! Eventually it wound its way to its new home in Church Street where it lived for a couple more decades, and went on public display at my parents annual “Bygones” open weekend. Sadly the vandalism in that area of town in the late 90’s did it a lot of damage and eventually my folks decided to take the now very fragile carriage on one last journey to the allotments where it now lives, and I believe Jane Bailey can add to the story from here about its arrival there! It arrived one lunchtime through the Marron Lane gate accompanied by Tony Marshall, Lynne Marshall and 4 or 5 others. Was pushed on rollers down the narrow riding towards Tony’s allotment but for some reason stopped half way and sat there for a day or two until it was finally moved into it’s position on the allotment. Looked somewhat incongruous stuck on the ridings I can tell you – and think Tony was more than a touch embarrased about the predicament !!! Still, all’s well that ends well as you can see by the photo !!!!! I am indebted to Julia Bennett for this photograph. 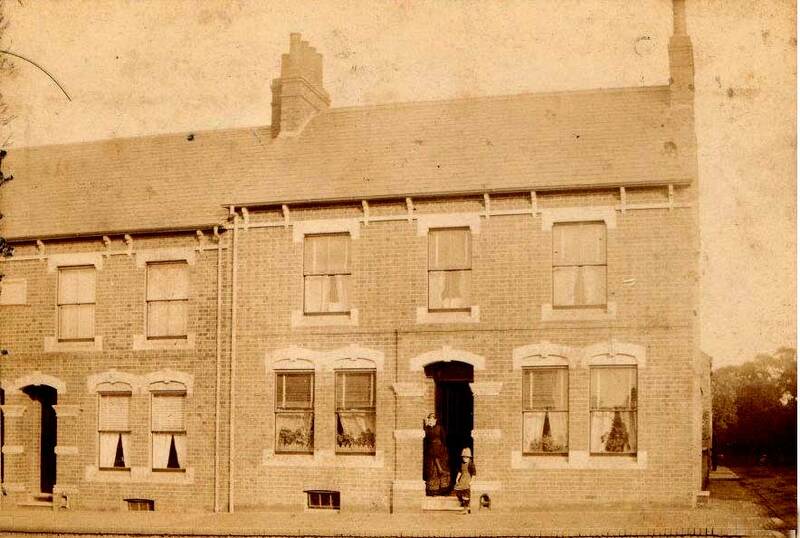 It is the house on the corner of Radcliffe Street and Aylesbury Street and is probably a very early photograph. As I wrote before Moreland Terrace was an 1880s expansion, completed in 1884. 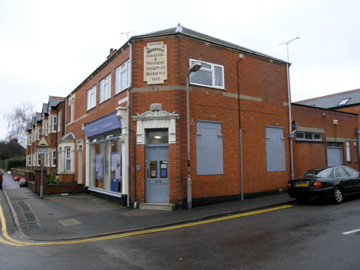 The picture shows the rather unique decorative elements around the doors and windows, quite unlike anywhere else in Wolverton. 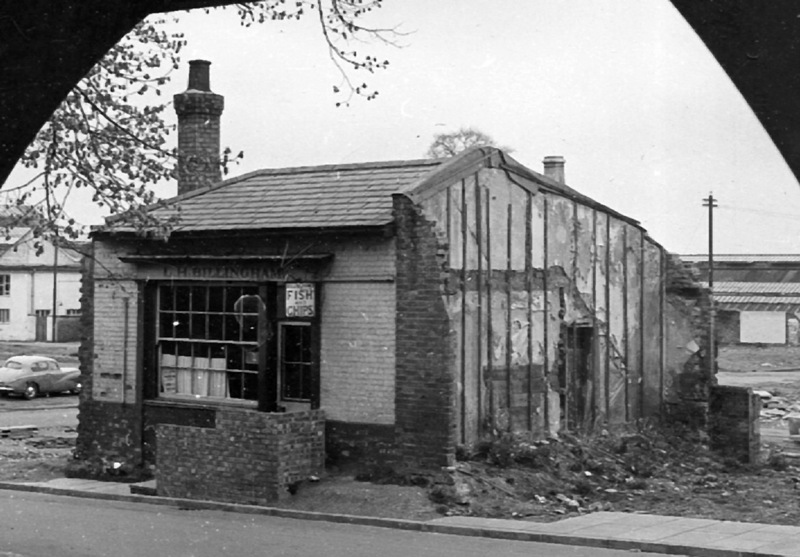 All of these disappeared when the buildings were converted into shops. Today, even the upstairs windows have been modified. It’s a large house with two front rooms with probably four bedrooms upstairs. It was clearly designed for a middle class occupant. Somewhat surprisingly the occupants are of more modest occupation. The head of the family in 1901 was William Bennett (The first letter is obscured, but it looks like Bennett) a horse trainer. He was then 58 and his wife 56. They had their 30 year old unmarried daughter Emily living with them. She was working at home as a dressmaker. The house also accommodated their widowed sister-in-law, a 31 year old nephew working as a clerk in the Railway Offices, and an unmarried 26 year old niece. So the house was full and between them they could probably afford it. 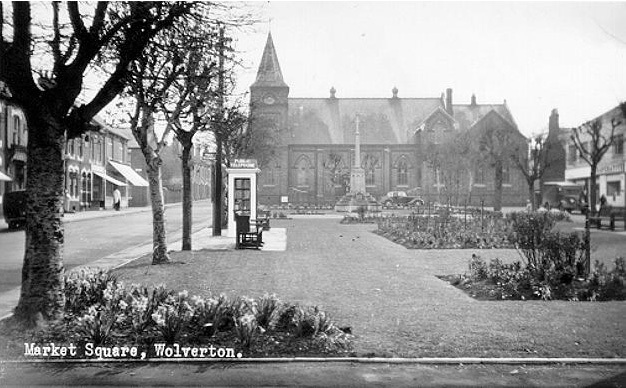 Squares were prestigious addresses in London in the 19th century and I am sure the intention was to do the same in Wolverton. 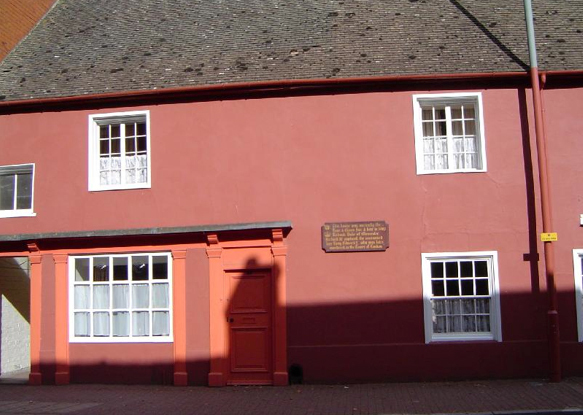 Some of the houses on the Square are quite large, but others are modest in size, so perhaps the grand plan did not quite achieve its objective. There were commercial considerations too. 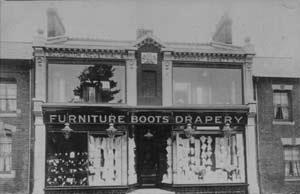 The 1890s expansion of Wolverton left the residents of Cambridge Street and Windsor Street a long way from the shops on the Front and Church Street and it was not long before shop frontages began to appear along Moreland Terrace. 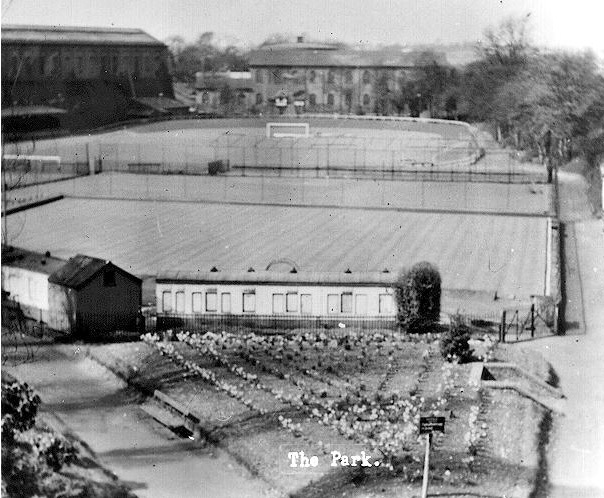 If you look at this photograph taken around 1910, you can see the beginnings of this development. This picture begins with Number 17 on the right, so we can’t tell if Number 21 had been converted by this date. 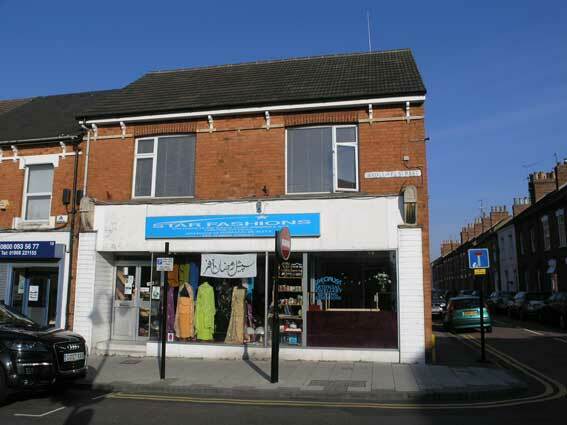 At the far end Number 1 was a drapery from the beginning but gradually a conversion to shops was taking place. 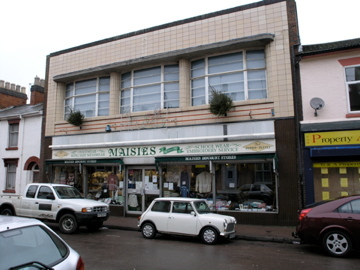 Only the shop at Number 9 has preserved its frontage. Note too the wrought iron railings around the Square. They were probably taken up during the 1914-18 war and melted down to make armaments. 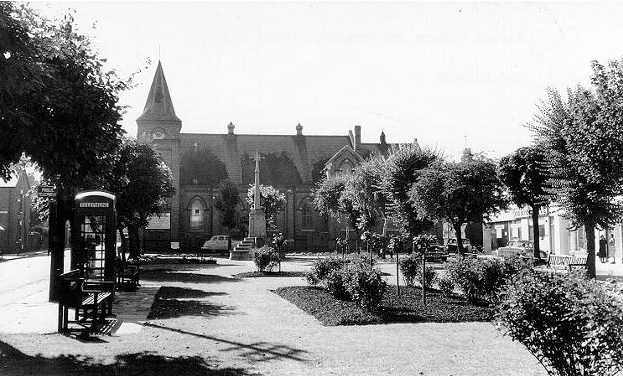 The Cenotaph was not built until after the war so the Square appears to be nothing more than a green space. 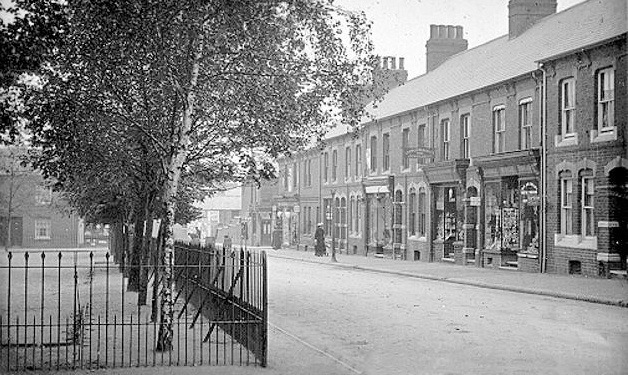 Below is Number 21 Morland Terrace today – hardly recognisable.